We are pleased to launch the magazine of philosophical studies Azimuth. Philosophical Coordinates in Modern and Contemporary Age. Not without a sense of amazement, since at such a time of deep crisis in the economy and in culture, and in the age of internet when publishing on paper is in decline, when academies, libraries and cultural institutions are closing down, the starting up, in Italy, of a philosophical journal on paper, what’s more by a group of scholars aged under thirty, may seem very surprising. The project was created in 2011 by a group of PhD students and resear­chers, all trained at Rome’s “La Sapienza’’ University, originally brought together by the online journal Lo Sguardo and now active in various faculties and institutes in Italy and abroad. In spite of that, our success in making this project a reality is essentially owed to one person, Tommaso Codignola, who ever since the early days of that initial experience in publishing, which is still going on today and is continuously evolving, has believed in the project and supported it, later contributing to the idea of giving a new dimension to the work already done. Azimuth, though largely maintaining the editorial structure of Lo Sguardo, arises from different philosophical requirements. The magazine is aimed at scholars looking at the international scene in philosophy and the human sciences who are interested in the evolutionary dimension of concepts and ideas in the modern and contemporary world. This sense of being in a two-way flow while attempting to integrate different thrusts in time and in thought, from the past to the present and from the present to the past, has been the idea guiding us from the beginning in creating our journal, and lies behind the specific choice of its name. The term azimuth actually derives from the Arabic as-sumut, which literally means “the directions”. Beyond the many suggestions its etymology might evoke, the important thing is that the azimuth defines an astronomical co-ordinate without which it is not possible to map the horizon and so establish a route in navigation. This is a magazine for those seeking their bearings. We are thinking, however, of a particular kind of explorers: those venturing out into philosophy, which Plato described as a “second navigation”. That means, most notably, those braving the perils of the ocean of concepts along the opposite route to the well-charted one, that of their historical phenomenology. Actually, thought in the modern age has always spontaneously seen itself as an exercise in navigation, and in particular navigation beyond the frontiers. 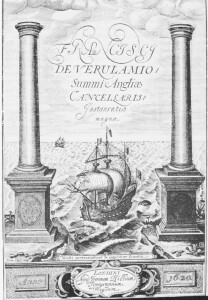 Launching the ideas behind the revolution in science and thought that was to shake the West right up until the present day, Francis Bacon had the cover illustration on the front of his Novum Organum (1620), the first part of the Instauratio Magna, represent a ship, the symbol of new knowledge, passing the Pillars of Hercules, the boundary of the known world. An image that was to be taken up by Hegel’s Vorlesungen über die Geschichte der Philosophie, with even Descartes on board the galleon of modernity as its look-out who would be the first to catch sight of the New World of philosophical thinking. It is significant that Bacon chose to show his ship in a particular moment of its navigation, just after it had gone beyond the frontier. In the English philosopher’s mind, the process whereby the advance of thought was to break away towards shores far away from those left behind was well under way. But we might say that it is always under way for modern thought in general, constantly and relentlessly reaching beyond the past, the known and whatever has already been said or thought, ceaselessly conquering new ground. While we write these lines we now, however, find ourselves in a time when that exploration has paradoxically been accomplished, the post-modern era characterised by the loss of the unexplored, by saturation with the known, by the disappearance of the unknown and therefore by an absence of depth. From here it sometimes looks as if philosophical thought has lost the impetus of desire to cover new ground, has come to a halt or even reached its end; or maybe not. To us it seems to have set sail along different and unseen routes: the internal ones of its own historical dimension. Sometimes, however, these routes take us along a journey that runs the opposite way from Bacon’s galleon as it sailed away from the mediaeval world, and take us back to those places once left behind, to revisit them and make them once again our own but, above all, to overstep the overstepping of our boundaries, generating a new and antilinear form of progress. In this curious form of navigation we would like this journal, like the azimuth, to serve as a device for finding one’s bearings. We would like to be bold enough to say it is a map, except that philosophical maps in general, and in particular those used for the historical navigation of concepts, are offered in the non-geographical form of a diary, always being updated and always already out of date, of previous navigational experiences. So we might say: a map of past and present navigation, a new logbook for old explorations to be revisited. To hold the memory of the routes by which we made our way before and must inevitably make our way again.